The Labyrinth Zone boss is the fourth boss encounter with Dr. Robotnik in Sonic the Hedgehog. 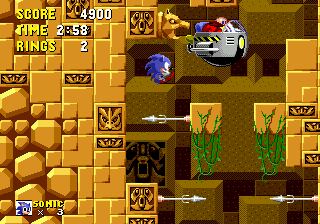 Uniquely to this Zone, Sonic the Hedgehog need not attack Robotnik to defeat him, and can simply chase him to the end of the Act as he escapes in his Eggpod, through an obstacle course with water rising from below. However, it is possible to defeat him for 1000 points; as in all other battles in the game, this requires Sonic to Spin Attack the Eggpod 8 times. In Sonic Mega Collection Plus, he is defeated in 3 hits. This boss returns in Sonic 4.